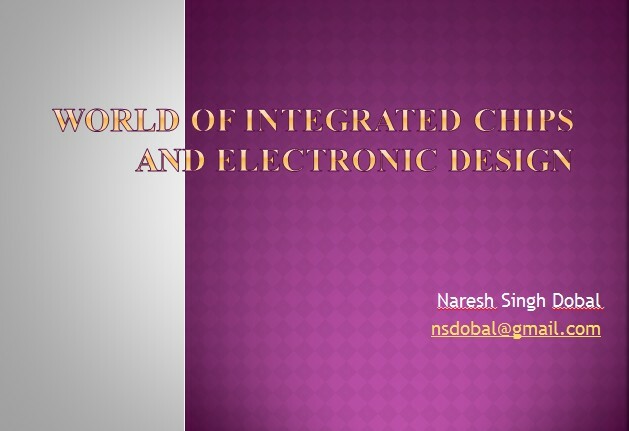 World of Integrated Chips and Electronic Design with Naresh Singh Dobal. Welcome you ALL in the ERA of this Interactive session named "World of Integrated Chips and Electronic Design, I am "Naresh Singh Dobal", and I am going to give you some amazing information's about our Semiconductor Industry. This small series will give you an idea about the VLSI chips, like how the computer chips are manufacture and how they are designed, This small Tutorial will develop a basic understanding of Semiconductor Industry, Don't Worry about this semiconductor term, I will explain that in my next session, and more about the EDA, EDA is Electronic Design Automation. I will tell you that how EDA are important to our semiconductor industry, because we actually in EDA a small industry, but we belongs to this great thing called Semiconductor Industry. Also we will follow the very simplified steps to process the manufacturing of computer chips and their designing. SIR,WHAT IS THE RECENT TREND GOING ON IN 2015 IN EDA INDUSTRY,WHERE IT IS GOING AND,HOW IS THE FUTURE?